Our head service and performance building packages brings to our customers an alternative to often over priced 2JZ cylinder heads. We start with a really high quality donor head, your head, or a brand new one from Toyota, disassemble, clean, and then go to work on it. After acid cleaning and dynamic media cleaned/etched, the head is checked for flatness. Typically the amount of aluminum removed in the milling process is anywhere between .0025" to .005" in a decking process to ensure a positive sealing to your block. A stock head gasket or our after market 4-layer MLS gasket can be used, as we only remove a small amount of metal in the process. This is followed with a moderate porting, which is coupled with a 3-angle valve job. Installation of either stock sized or +1mm over sized high temperature stainless valves (for large A/R ratio turbos) is completed. Brian Crower (son of Mr. Crower) Bronze Valve Guides are installed. Head is hand assembled and finished off with BC high performance valve springs (8,700 rpm), BC Titanium retainers and factory OEM Toyota locks to tie it all together. You get a complete head (minus cams), which will give you the peace of mind for higher rev's, better flow and 30 HP gain on the work alone. You can gain 75+ HP on this head with the right cams!! 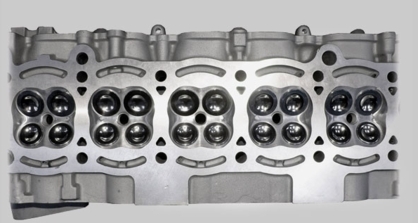 Price is based upon the customer supplying the cylinder head. If you do not have a core to provide, we can procure a used head or brand new from Toyota, both at additional cost. Please contact us with any questions or special requests as well as your planned build so we can coordinate exactly what your needs are and fulfill them! Our "base" stage 2 kit includes Brian Crower brand hardware which has been proven time and time again, however we will be happy to accommodate your build if you have other brand preferences (SuperTech, Ferrea, GSC, etc.). Check with us for a shipping quote to and from your area. It may be less expensive for us to provide you a label to ship your head both ways. Shipping to us is not included in base price.